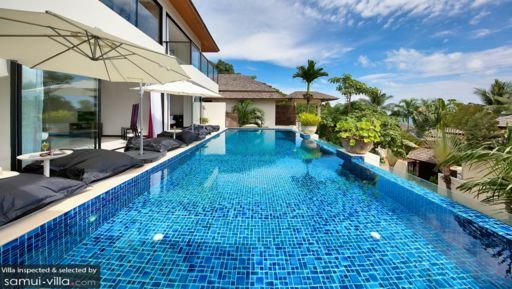 Nestled close to the coasts of Bophut, Baan Maliwan enjoys a restful, serene environment. The living spaces are homely and contemporary, and with three bedrooms, the villa is ideally set up for small travelling parties. 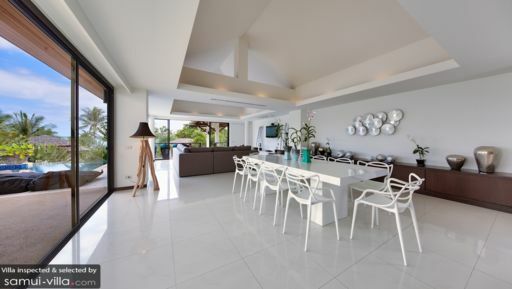 Immaculate service from a team of on-site staff makes this villa a standout from the rest. Six guests are accommodated in three bedrooms. The master bedroom sets itself apart from the guest rooms with amenities like a four poster bed, bamboo-crafted love seat, sun-soaked balcony and generously proportioned dressing area. 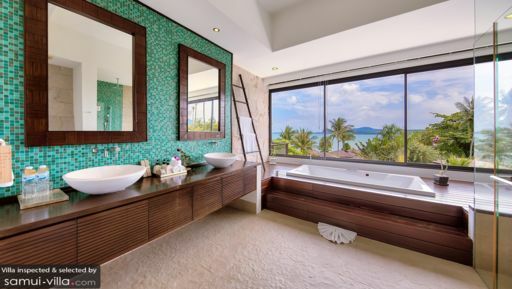 The attached en suite is immaculate, featuring a sunken tub framed by a wooden deck. Large windows let in plenty of light, and lets you enjoy the coastal landscape while taking a soak. Both guest bedrooms offer air conditioned interiors, ample wardrobe space and private en suite equipped with shower recess, sink and toilet. One of the room is kitted out with a king bed while the other features twin singles. A glistening pool takes centerstage outdoors at Baan Maliwan; it’s where vacationers cool off with refreshing dips and soak up the breezy Samui vibes. Dry off with a lazy sunbathing session before you slip back indoors. You’re greeted with the sight of a capacious common area the moment you step in at Baan Maliwan. It’s bright and airy, thanks to extensive glass sliding doors that open out to the pool. The indoor lounge is made cosy and comfortable with sofas, arm chairs, a coffee table, floor rug and flat screen TV. It extends out to include a dining area furnished with an all-white dining set and an open kitchen complete with breakfast bar. Delivering attentive and impeccable service, the staff will make you feel that it’s all about you at Baan Maliwan. Daily breakfast, along with personal guest assistance and housekeeping service are included with your stay - but your villa manager will readily go out of his way to attend to your holiday needs. Extra beds, airport pick-up, babysitter, car rental, driver and in-villa massage services are available at additional cost. The northern coasts of Samui offers just the right balance of entertainment and relaxation; there’s a good variety of dining and shopping venues in the vicinity, yet the area retains a laidback, family-friendly atmosphere. Bophut Beach is seven minutes’ drive away. Unlike the bustling coasts of Chaweng or Lamai, the beach and its surrounding areas isn’t dotted with nightlife venues or girlie bars - so it’s ideal for families with young children. Just a skip away from the beach is Bophut Fisherman’s Village, where you’ll find upscale dining establishments and boutique shops aplenty. There are many ways to unwind in this charming coastal town. Join in a group yoga class at The Yogarden Samui (seven minutes’ drive) or enjoy a decadent spa ritual at Zazen Boutique Resort & Spa (three minutes’ drive). Evenings are best spent in a slow, unhurried manner at venues like Elephant Beach Club or The Crow’s Nest, before settling down for dinner. There’s exotic fusion fare at Orgasmic and fresh seafood at Barracuda @ The Wharf, but for an intimate, fine dining experience, we’d recommend 9Gems Samui Lounge Restaurant for its fantastic ambience. We moved here after painful experience rentals live, the view from this villa has fulfilled our wishes and to forget the previous horrible Everything is perfect for the ideal vacation Master suite with shower and bath sea view (full amenities) Bedding excellent bath linen in very good condition Exceptional kitchen with all the utensils even if the purpose was not to cook n (but l did !!!) Large and well maintained pool with beautiful pots lotus To wake in the morning we were met Breakfast al ready time requested, plentiful grain peeled fresh fruit , Staff smiling, available even for galley (accident requiring hospital) The night staff reverts see prepare the villa for the night and turn the lights on your bed by placing a small object made of palm leaf different every night Mets of scented oil to your room to repel mosquitoes Unreal We had already rented by this agency. E core once kept its promises Thank you to Heidi and her staff I quickly resell. Service: Service was excellent and very attentive both before and during our stay. The agency has been very helpful in the time leading up to our trip, helping us organize activities ahead and changing our reservations (several times) as needed. They generally responded immediately to our emails. We were worried about concierge services (not being in a hotel) but they were fantastic about organizing stuff for us and accommodating all of our requests (not always easy). We were 5 adults (2 couples and 1 single) with different requirements. They assigned an agent on call to us and he was eager to help and came by our villa to make sure everything was ok. We rented a car through them and everything went smoothly. The rental car was delivered and picked up at our villa. They organized a boat trip for us which went very well. They even made sure to organize our lunch for the boat trip and have it delivered to the boat, and they came to pick us up to bring us to the pier and back. One of our friends got sick and they immediately organized a doctor. For New Year's Eve they organized a van with driver to be with us for the entire evening. At the villa we had 3 full-time staff and they were all very kind. The manageress made sure that we always had what we needed and helped coordinating with the agency for our activities. She was very helpful and attentive. She organized a chef for us one evening and it was one of the best meals we had in Thailand (definitely the best we had in Ko Samui). The manageress also prepared us breakfast every morning, which consisted of breads, croissants, cereals, fruits, juices, tea, coffee, milk. The villa: The villa was nice and comfortable. All 3 bedrooms are nice and have good bathrooms. The living/dining room is also nice and spacious. It is kept very clean. The pool is pleasant. WiFi connection is good. Unfortunately, there isn’t much of an outside area to hang, but we knew that from the pictures. loved the villas and were most impressed with all the staff.